Well, he did it again; my son, I mean, the one who wanted to be a priest. For his birthday on September 25, Justin wanted only one thing – a quilt to give to some friends of his that were starting a church near Las Vegas, South Hills Community Church in Henderson, NV. He spent a weekend with these people and was distressed by the fact that they had no art at all on their walls. This church had taken, as its mission statement, a reading from Revelations, where John has a vision of Christ in white robes and white hair, with fire coming from His eyes, a two-edged sword coming from His mouth, seven silver stars in His right hand and seven golden lampstands around His feet. And, oh yes, His feet were glowing like bronze. The stars and lampstands were, apparently, a metaphor for the creation of seven churches way back at the beginning of it all. (What the glowing feet have to do with anything is way beyond me, but Justin seemed to think they were important.) Justin thought this would make a great wallhanging for his friends’ empty church office walls. Yeah, right. When I asked him if he had a picture I could work from, his reply was that no, he didn’t, but his friend had a tattoo of it. Great. And when did Justin want this to be done? By his birthday. Of course (about ten days away). 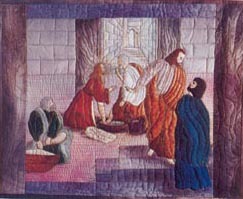 Now, this is really not as far out of the ballpark for me as one might think, because I have made liturgical quilts before; large liturgical quilts based on scripture passages about Pentecost, Easter, and Advent, so this would be a piece of cake, right? The first problem was the background. There was no time to piece anything, but it just so happened there was a wonderful piece of Mickey Lawler’s Skydyes fabric in my stash, a piece bought about two years ago because it was absolutely essential for a “special” project. You know the one, the “special project” we’re all are going to make someday. Of course, one never really wants to use Skydyes fabric up, but there comes a time when one simply has to grin and bear it. Having no time to lose, it was time to hunt around for a picture of Jesus. Oddly enough, there didn’t seem to be a great glut of pictures like the one the reading described, so I finally decided that a picture of Jesus stretching out his hand to help Peter was going to be as close as one could get to having Jesus in the right pose. I enlarged this figure to a traceable size using mylar tracing paper (one side frosted), then drew a 1” grid on my tracing paper and a larger grid on some big sheets of tracing paper, and transferred the drawing block by block to the larger paper, then put the original drawing for the face and hands on the scanner and enlarged them to the finished size. I have no idea why I didn't just take it to a copy shop, but I was young and stupid, then. I taped the drawing to the window, then taped the fabric over that, and traced the Jesus figure onto the background lightly with a pencil, so I’d know where to appliqué the figure. Then came the hard part. It really wasn’t easy to make a face with fire coming out of His eyes and a sword out of His mouth, and make it something that a person would really want to look at. It took a couple of tries to get the face to come out right, but when a drawing finally looked right, I traced that with permanent Pigma markers onto fine-grained white broadcloth. Then it was time to get out the pastel chalks and shade the face, arms, hands, and feet. After that, it was just a question of getting out the Setacolor fabric paints and painting a white beard, moustache, and hair. It looked rather strange, having Jesus with white hair and beard, but who can argue with John? Once these pieces were shaded, I took the large tracing paper copy and glued it to cardboard with a gluestick, then cut the pieces of cardboard out and used them as templates to turn the edges of the pieces under. Once that was done, the pieces could be pinned to the background fabric, where the pencil outline lay waiting. Having decided it would be really gross to have a sword actually coming out of His mouth, even though that’s what Justin wanted, we settled for having it behind His head just looking like it was coming out of His mouth. Of course, there had to be a glowing aura around His head, but that was easily solved with a piece of opalescent organdie cut to approximately the right size, its edges melted in the flame of a candle, put behind Jesus’ head. Okay, ready for clothes. The clothes had to be white, like judge’s robes. White silk charmeuse for the shawl, and china silk for the robes seemed sufficiently opulent fabrics for a Judge; besides, there was lots of it leftover from silk painting projects. Rather than cut out patterns for these clothes, it was more fun to just pin the fabric to the background and begin draping it, building in folds and depth, then appliqué the fabric for the clothes with a tiny zigzag stitch and invisible thread. This worked out fairly well, but the robes didn’t have enough depth, even with the folds built in, so out came the paints again. It was necessary to mix up a very diluted purple/black/blue wash, and stroke it into all of the folds of the garment, to make the folds acceptably noticeable. The trim was easy. It was fused and satin-stitched goldy-white fabric; at least, it was easy until the fabric started to shred, after it was already stitched and fused on, of course. It was finally necessary to satin stitch some nylon net over the trim so it would stop shredding. The next problem was the stars. How big should they be, and what size? They couldn’t be too big and still be in His right hand, so after a couple of false starts and some more input from Justin, we finally settled on more melted edged opalescent organdie, heavily machine embroidered with hologram thread, with a Schwarovsky crystal sewn into the center of each one. The glowing feet weren’t much of problem, since the glow could just be machine embroidered with metallic thread. The real problem was the lampstands. What the heck does a golden lampstand look like, anyway? After checking several sources which were absolutely useless, I finally just made up a shape, made it in several sizes, then played with those shapes until a logical pattern emerged. Then the patterns were traced onto Steam a Seam II, which was then ironed to the back of a gold lame fabric. The release paper was torn off, the lampstands were scattered around His feet, fused, then satin-stitch appliquéd in place. They probably aren’t accurate lampstands, but if you ever find out what they should really look like, don’t tell anybody they’re wrong, okay? It’s way too late, now. They’re FUSED. Justin said that Jesus’ words were also very important, so they were printed them out on the computer and traced onto freezer paper. The letters were carefully cut out and thrown away, then the remaining freezer paper was ironed to some purple border fabric. The letters were then stenciled in with Lumière and Setacolor luminescent and pearlescent paints. It had to be done three times, so the letters would show on the purple. After that, it was an easy matter to make a wooden cross on some purple grape background fabric for the back, layer it all together, and quilt it with metallic and hologram thread. All in all, the quilt only took nine days to make, the church people seemed very happy to get the quilt when we took it to them, and Justin was happy. But then he did it again. In early December he sent me an e-mail saying that his friends in England wanted to know why he doesn’t have any quilts at school, since his Mom is such a “hotshot quilter.” I suggested it was because he didn’t take any with him, and asked him if he wanted me to bring him his quilt when we went to visit him in England at Christmas. He replied that what he really wanted was a wallhanging of Jesus washing the disciples’ feet; maybe four or five of them, with a towel around Jesus’ waist, and expressions of concern and consternation on the disciples’ faces. Yeah. Right. No problem. By Christmas. Of course, along with the seventy million other things I have to do. Sure. That one really turned out to be fairly easy, since he only wanted a small wallhanging. about 18” x 24,” which I call “Go and Do Likewise.” It even fit nicely in my little carry-on suitcase when we went to see him. What really scares me is the question of what he’s going to come up with next. So, here's the Go Ye and Do Likewise piece that I made for his dorm room in England. It's not very big, but you can see what's happening. While graduating from the University of San Francisco, Justin graduated as Philosophy Student of the Year, but decided (in his Senior year, of course) that he no longer wanted to be a priest. I asked him why, and he said he'd finally realized that Catholicism wasn't the only viable religion in the world. DUHHHHHH! I then commented that I thought maybe he had wasted all of those years at USF. He vehemently assured me that his years at USF had taught him to think, to ponder, to question, to analyze, to discern, and that is what education is all about. He is now an entrepreneur, making his own way in the anatomically correct fields of nutrition, posture alignment, personal training to the stars in Hollywood, whole food diets, weight loss, blood problems, high blood pressure, and down to earth philosophy. His website is http://www.biofit.com. if you would like to have your blood analyzed, get fit, get yourself out of chronic pain, or just see my amazingly talented and gorgeous son, click on that link.